Also known as a German turnip or turnip cabbage, this pale green, stout vegetable, resembles a turnip with antennae- like shoots, forming from its squat bulb, not too dissimilar to 'Sputnik' in a vegetable form! 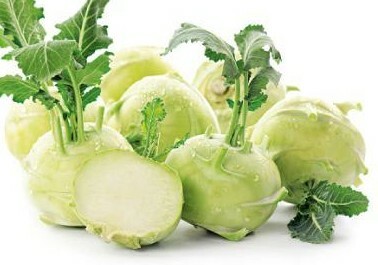 Kohlrabi has a crisp, almost crunchy texture and a sweet, yet mild flavour, a cross between a turnip and a water chestnut. It can be grown in two colours, the more usual pale green, but occasionally in pinky purple. Kohlrabi is often eaten raw; once peeled it can chopped into cubes and added to a mixed green salad or cut into thin strips together with carrots, courgettes and fennel to make a coleslaw. The vegetable can also be roasted or steamed like a turnip and eaten with meat or fish and the leaves cooked like cabbage or kale and served as a vegetable accompaniment. So next time you are wandering through Machane Yehuda in Jerusalem or Tel Aviv's Carmel market, don't walk pass the 'alien' vegetable, buy one or two, add it to a super healthy salad and discover the sweet taste of Kohlrabi.